I believe it's not always necessary to use a lot of ingredients to make a great dish. Learning to choose a very few high quality ingredients will help you prepare a very special meal. That's one of the reasons Italians are The masters of cooking. In Italian cooking one of the most important thing is the quality of each ingredient, which ones you can use together and how you cook them. For today, a pack of good quality dried pasta + my lovely organic cherry tomatoes and some seasoning will help me to cook one of the most famous Italian dishes called | Pasta al Pomodoro. Sweet&hot, aromatic, silky and yet delicious. Wash the cherry tomatoes, cut them into pieces, cook them with a glass of hot water, salt, black pepper, some fresh basil, cloves of garlic and a small onion on a medium high heat. When it starts to boil, reduce the heat and leave it until 1/3 of the water evaporates, then remove the garlic, the onion and the basil. Blend the tomatoes and reduce the sauce, add some extra virgin olive oil, chili powder and seasoning, continue cooking till the oil is on top. 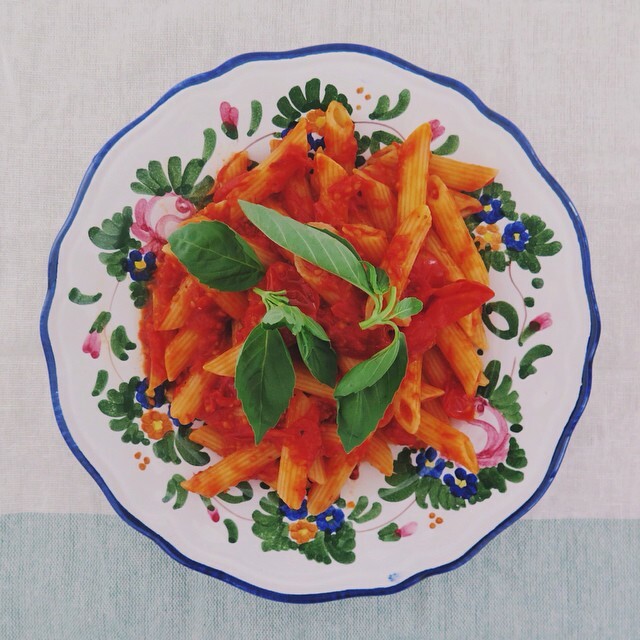 Boil about 250-300 gram of pasta, mix it with the tomato sauce and finish it with some fresh basil. Use extra virgin olive oil on top of your pasta dish to make it an original Italian dish). Remember, in Italy the sauce does not go on the top of the white pasta, but it is always mixed with it.